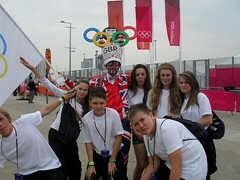 What an Opportunity – Brockington go Olympic Style!!! 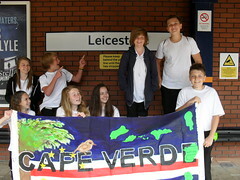 On Friday 27th July, 8 Brockington pupils left Leicester train station early in the morning to travel to the Olympic Park to take part in the Guard of Honour at the Olympic opening ceremony. We had been invited by the London Organising Committee for the Olympic Games to be one of 200 schools to take part in this fantastic event. The train journey went quite quickly as the pupils entertained the staff! On arrival at St. Pancreas we caught the Javelin train to the Olympic Park at Stratford, London. The atmosphere was amazing and the pupils soon got into the swing of capturing the spirit. Camera’s were snapping as we had our eyes peeled for sports stars. We went quickly through security and entered the amazing Olympic Park. From here we had a tour of the site and saw the Aquatics Centre, Velodrome, Stadium, River Bank Arena and many more. We were informed of the build up to the games and the sustainability of certain venues. From here we went for our official photographs with our flag. Our adopted country to celebrate alongside Great Britain was Cape Verde. Next we went to our “holding” camp in the Copper Box. The venue for the forthcoming Handball was amazing. We received our Guard of Honour T shirts and had more to eat!!! At 8.30pm, we made our way to our Guard of Honour position. As the excitement was building up for the arrival of the athletes, we saw many of the dancers who were performing in the opening ceremony. We were lucky enough to witness the helicopters hovering in the sky who were to deliver the Queen and James Bond!! The atmosphere was electric. Soon the athletes started arriving and the cheers went up. We greeted the Greek team first and then the others nations entered alphabetically. Cape Verde had a team of 3 being one of the smallest nations!! When they saw our flag and heard our screams…they were ecstatic! Unfortunately for the Brockington group, we had to leave to catch the last train back just as the countries beginning with J were about to approach. We were gutted at the thought of not seeing the legendary Usain Bolt. However… we showed spirit and determination (…and a little bit of jostling!!) to ensure we got our glance of one the Games main characters. The photo’s might be a bit blurred but we saw the man!!! From then it was full speed ahead to make sure we got on our way to get the train back to Leicester. Unfortunately a certain Mr Beckham delayed us further! We were unable to cross the bridge out of the Olympic Park until he had whizzed by amid the fireworks in his speed boat!!! But we were there!!! We got back to St. Pancreas in time for refreshments and our train. Miss Wyeth and Miss Heggs had a much needed hot chocolate while the pupils reminisced of their day. Fraser Burbery treated us to a little sing song around the piano in the station before we boarded the train back to Leicester. Staff hoped the group might chill out a little but no they were still buzzing all the way back to Leicester!! We were met by the parents who seemed to be as excited as the pupils despite the fact it was nearly 2am! The pupils who took part were Erin Hall, Lotte Bozon, Emma McGuigan, Paige Rowell, Fraser Burbery, Adam Daybell, Callum Franks and Tom Copley. Their behaviour was excellent and they really did keep the staff entertained. We had an incredible day, a once in a lifetime experience and the memories will live with us for a lifetime.